This awesome amusement park is located in West Ocean City, Maryland, a mile west of the Route 50 Bridge on the right-hand side. This is a family entertainment center that offers tons of fun in the form of go-karts, miniature golf, bumper boats, arcades and kiddie rides and a lot more. With many attractions to choose from, you will surely have fun and a memorable experience here. Bring the whole family and have fun at Baja Amusements. Have your entire family enjoy Baja Amusements with this coupons. Click here or on the coupon to print it!!! 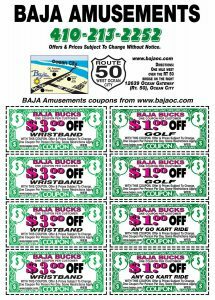 Other Specials & Coupons To view Baja Amusements Admission Tickets, other Specials and Coupons, go to their special page by clicking here. Baja Amusements updates this page throughout the year, so check back to see if new specials and coupons have come in. Note to our visitors: Baja Amusements coupons and specials can change without notice. So please visit their official website to make sure of the latest pricing and coupons.